Happy ten months, my son! This has been another big month for you, my love. You have learned a lot of new things over the past few months (and I just had to make a video). You got both of your top teeth this month (the left one first, in the end of the first week of March, and then the right one came the middle of last week) so that brings the total to four teeth. I can see three more on their way in, but who knows when they'll show up. You also learned to climb the stairs this month! The same day I posted these photographs of you climbing onto things, you climbed the whole staircase trying to reach me in the upstairs bathroom. I was so surprised, and you've continued to do it over and over. You enjoy it so much that we haven't put a gate up to prevent you from doing it. You're always supervised and it's turning out to be a great outlet for all of your energy! You're making tons of progress with your sensory processing therapies, and Papa and I could not be more thrilled. I am so proud of you for doing such hard work, and it's so wonderful to see you getting more comfortable in your body and exploring your world more every day. 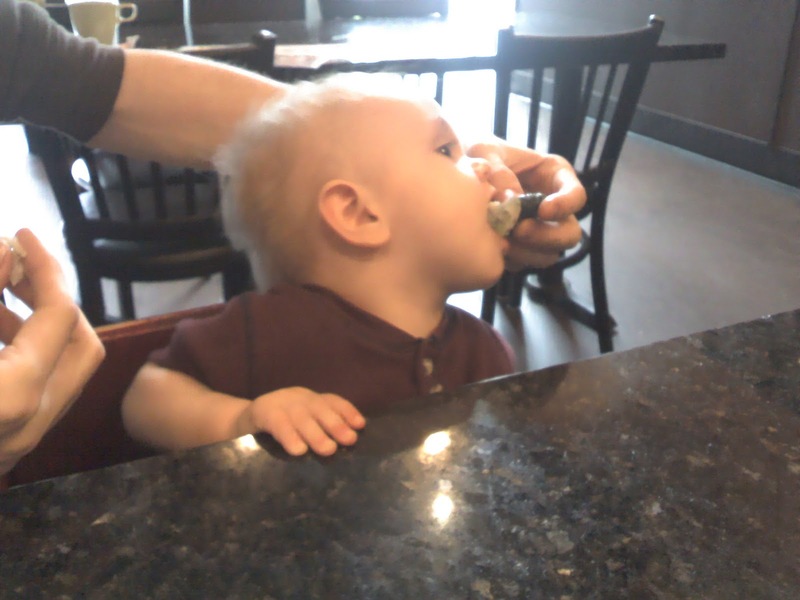 Papa's helping you eat an avocado roll. Yum! Because of our new feeding technique (holding you on our laps or letting you stand while eating) you're consuming a larger quantity of solid foods, and you actually seem to be having fun while eating now. The new foods you tried this month are: bean spouts, whole rice, onion, goat cheese, oatmeal, black bean, pinto bean, kale, corn, molasses, coconut milk, quinoa, celery, apple, chick pea, beef, and crab. At this point, we've stopped giving you any (non-human) dairy because both cow and goat cheese have caused reactions. We'll try dairy again in a few months to see how it goes then. Eating meals with you has gotten a whole lot more fun now that you can chew most things. I'm not making much special baby food for you anymore (aside from cereals and some fruits). We usually just make foods that will be easy for you to eat (soups, beans, cooked vegetables, etc.) and you eat from our plates and bowls. When we go out to dinner, we make sure to order something you can eat, too. At a sushi restaurant, you can have an avocado roll; when we went out for wings recently, you had bits of sweet potato fries and small pieces of chicken. You can feed yourself easily with your hands if the foods aren't too slippery. Otherwise, we still help you out. You are also able to recognize when there's a piece of food which is partially hanging out of your mouth, and you reach up and push it in with your hand. You LOVE to watch the washing machine. You're starting to really enjoy trying to figure out how things work. You know how to turn the light switches ON and OFF, which provides endless amusement. You like to play with things that have hinges, like the cap on my water bottle, opening and closing it again and again. You also know how to open and close doors. This new skill is slightly inconvenient when you get into the pantry cabinet and pull things off the shelves. But it is particularly adorable when you wake up from your nap and crawl out of your bed and over to the door. I can usually make it to the stairs just in time to see you open the door (which I've left unlatched) and crawl to the gate and stand up, ready to be picked up. It's so fun to witness your growing independence! You still like to "help" with the dishes. Speaking of independence, you're getting much better at standing and cruising now. Often, when we're feeding you a meal, you'll slowly migrate all the way around the coffee table while you're chewing your food. Crawling is still your preferred method of transportation, but more often than not, you'll stand up and cruise around when you get to where ever you were going. When I'm holding you and put you down now, you like to be put down standing up instead of sitting down. You're really enjoying splashing in the bathtub now, which can be a little messy but is so much fun. Since Papa or I usually get in the bath with you, we get to enjoy the playtime, too. Another thing you're doing more and more is clapping when you're happy or when something excites you. You also like to use your hands to bang on things (like the whole world is a giant drum set). Some of your favorites are: windows, the (metal) kitchen trash can, and the toilet seat. My favorite is the window—I hold you up there and you giggle and slap it until you get tired. One day you were doing this and one of the neighbors drove up and saw you doing it and he was laughing and laughing. I imagine it looks pretty funny from the other side of the window, though I've never seen you doing it from that angle. Playing with Eddie is definitely one of your all-time favorite things to do. When you see him, you smile and laugh and start crawling toward him (and sometimes you squeal loudly, which scares him away). Often, he will let you "pet" him (pull at his fur) and sometimes you two even play games together. Ed likes to chew on plastic drinking straws, and if you find a straw, you'll taunt him with it. You've discovered the stash of other kitty toys, too, and you just never get tired of playing games with the cats. You love to kick your legs, flap your arms, and squeal whenever one of us is doing something you like or want us to do again. You love it when we imitate whatever you're doing (in fact, as I type this, we're playing a game where you lean over sideways, then I do it, then you laugh, repeat). You like shaking your head back and forth (your OT says this is one of the ways you're helping to organize your nervous system) and you think it's hilarious when I shake my head back at you. You also (unlike Momma) love to be tickled and you're ticklish in many parts of your body. (Plus, your body is still so small that it's hard to touch you without touching one of the ticklish parts!) I like to play "chase" with you while you're crawling away from me...but you always stop and sit up so I can catch you because you know I'll tickle you when I get there. When I let go, you crawl just a few inches, then stop and sit up again, looking back at me to see if I'm going to tickle you again. I don't even really have to touch you for you to start giggling at that point...you know it's coming and you laugh and laugh! I saved the biggest development for last: you've learned your first word! You can say "mama," or more often, "ma-ma-ma-ma-ma" (etc.) but it always means that you want me. It's quite gratifying (for both of us, I think) when you say "mama" and I respond. You say "mama" when you wake up from your naps, when you bump your head or fall down and need to be comforted, when you're tired and need to be cuddled, and when you want to nurse. You still also use our sign for nurse, and when you sign it, I say "Nurse?" and you smile at me and sign it again. I know I say this just about every month, but I still can't believe how fast you're growing up. It's so delightful to wake up to you every morning and kiss you goodnight. You are so much more interactive, expressive, and communicative than you were just a few weeks ago, and that makes it even more fun to be your parent. I'm really enjoying getting to know you. Thanks for being my kiddo. Awww, so sweet! And exciting time.